The ‘other’ Hollywood studio version of the Alamo story is quite good, with strong production values, exciting stunt battle action and something Republic Pictures didn’t manage very often, a solid screenplay. Sterling Hayden is Jim Bowie, this version’s central hero, with great backup from Anna Maria Alberghetti, Ernest Borgnine, J. Carrol Naish, and Ben Cooper. But best of all is that old hay-shaker Arthur Hunnicutt, as the movies’ best and most natural Davy Crockett. Starring: Sterling Hayden, Anna Maria Alberghetti, Richard Carlson, Arthur Hunnicutt, Ernest Borgnine, J. Carrol Naish, Ben Cooper, John Russell, Virginia Grey, Jim Davis, Eduard Franz, Otto Kruger, Russell Simpson, Roy Roberts, Slim Pickens, Hugh Sanders, Morris Ankrum, Argentina Brunetti, Robert Burton. The saga of the Alamo is one of those stories that’s just un-killable. It works no matter how it’s presented, even though everybody knows the ending… maybe because everybody knows the ending. I clearly remember, at the age of four, accidentally whacking my poor sister in the head while rocking out to Fess Parker on a 12-inch TV screen. The go-to version of the Alamo story is of course John Wayne’s enormous 70mm road show epic from 1960. Although not really acknowledged as a particularly good movie, it looks simply colossal on a big screen. There are of course a few discrepancies between the historical event in ‘San Antone’ and the various patriotic film retellings. Let’s just say that all the versions overlook one of the main motivations for the American annexation of Texas: to incorporate slave-state status onto the nation’s westward expansion. Excellent reading on Wayne’s film can be had in the revisionist film history book by J. Hoberman, The Dream Life. According to the author, in that election year Wayne’s The Alamo and Douglas & Kubrick’s Spartacus competed lance-to-spear for the hearts and minds of the nation. Which political allegory offered the most desired ideological vision for America: Wayne’s right-wing view or the leftist view of Dalton Trumbo and Howard Fast? The 1955 Republic Picture The Last Command is connected to Wayne’s epic in more ways than one. Wayne was always strongly allied with and deeply loyal to Republic. After he became a producer with 1947’s Angel and the Badman, the dream project he kept trying to sell Republic head Herbert J. Yates was the Alamo story. Because it required epic battle scenes, it was a rather big subject for the small studio to take on. The idea simmered for years, with Wayne distracted and Republic stalling. To Wayne’s dismay, Yates went forward with the production without the star’s participation, a choice that ended their relationship. Republic can’t be accused of going cheap on its Alamo story. Their bigger westerns and costume pictures often used large sets and many extras, and the studio of course had access to a deep inventory of horses, horsemen and quality stunts — it’s just they almost always applied these assets to mediocre screenplays. With its not-bad-at-all storyline, The Last Command gets a maximum visual return on its investment. Yes, we don’t see two thousand soldiers marching onto the battlefield, but it’s also not twenty extras trying to be two hundred. Old hands Frank Lloyd (Mutiny on the Bounty) and William Witney (Master of the World) whipped up some excellent battle action for the rousing finale, accessing the kinds of stunt work that had graced the studio’s twenty years’ worth of action serials. Viewers that had just seen Disney’s King of the Wild Frontier on TV must have been impressed by Command’s much-enlarged canvas. Republic could usually be counted on for uninteresting casting, so the fine roster of actors for this show is quite a surprise. Did any of these names sign on thinking they’d be working with John Wayne? Established star Sterling Hayden was up for anything that promised a paycheck (gotta pay off that sailboat!). The older cast consists of well-chosen pros: J. Carroll Naish, Eduard Franz, Otto Kruger, Russell Simpson, Jim Davis, Slim Pickens. At this time Anna Maria Alberghetti had barely more than a so-so Frank Capra picture under her belt. Ben Cooper was likely a shoo-in from Republic’s previous hit Johnny Guitar. Command couldn’t find a better Davy Crockett than Arthur Hunnicutt. The loose-limbed raconteur became a favorite in the great 1952 western The Big Sky, for which he was nominated for a supporting actor Oscar. Hunnicutt is Davy Crockett, far more than Fess Parker or John Wayne. By the time Command appeared, Ernest Borgnine’s Marty had already been in release for several months. Although Borgnine continued playing heavies, I’m told that audiences would sometimes applaud when he appeared on screen. The Last Command roughly follows the path of frontier legend Jim Bowie (Sterling Hayden) to his destiny at the Alamo. After his wife and child succumb to sickness, Bowie casts about for something to do, and falls in love with Señorita Consuelo de Quesada (Anna Maria Alberghetti) the teenaged daughter of a prosperous rancher (Edouard Franz). Bowie soon becomes entangled in the revolt of several Texican landowners against the rule of General Santa Ana (J. Carroll Naish), who happens to be an old friend of Bowie’s. Observing various 19th-century diplomatic niceties, rebels William Travis (Richard Carlson), Lt. Dickinson (John Russell), Stephen Austin (Otto Kruger) and Sam Houston (Hugh Sanders) skirmish with Mexican troops and then choose to make a principled stand against them at a mission compound called The Alamo. Pride and patriotism cause the defenders (fewer than two hundred) to fight to the death against Santa Anna’s thousands. The movie has character touches lacking in the epic version, which mostly offers John Wayne’s bigger-than-life personality. Jim Bowie is naturally given aspects of Sterling Hayden’s quiet but firm screen persona, which serves the film well for the frontiersman’s genteel flirtation with the gorgeous Alberghetti. The legendary rough ‘n’ ready recklessness of the frontier finds expression through Bowie’s willingness to fight with knives with the powerful Mike Radin (Ernest Borgnine) — simply because a fight sounds like a good idea. Davy Crockett and his Tennesseans arrive with a jolly round of drinking and tall tale tellin’, encouraging the frontier camaraderie. The second half of the film mirrors in great detail the particulars of the John Wayne version. The jockeying for command between Travis and Bowie is sketched, rather than drawn out. The predicament of Lt. Dickinson’s wife (Virginia Grey) is the same — as the battle nears she refuses to leave with her children. Of course, in 1836 women and children would be presumed to be non-combatants, and afforded the courtesy of not being massacred with the able-bodied men. Instead of Frankie Avalon being sent out to contact Sam Houston, young Ben Cooper does the honors. Command is on the long side for a Republic picture, but it doesn’t drag things out. Instead of affording each of the director’s pals the opportunity to recite numerous speeches and prayers in close-up, Command keeps the ‘book preachin” in perspective by giving The Parson (Russell Simpson) two or three quick appeals to the Lord above, for reinforcements to save their skins. Obviously The Last Command can’t compete with The Alamo for sheer epic grandeur. The shocking thing is that a great many of the action stunts in the Wayne picture are exact copies of what we see in Frank Lloyd’s movie. Key defenders are given spectacular All-Star special guest stunt deaths. They plunge off parapets, take multiple bayonets, etc.. In the tradition of superhuman playground heroics, almost all of them wreak maximum mayhem on the enemy as they bleed and fall, a-feudin’ and a-fussin’ and doing everything but rising for applause. The identical stunt action is seen repeatedly, right down to when the mortally wounded Davy Crockett ignites a black powder explosion. Hayden’s Jim Bowie, wounded and bedridden, unloads several weapons before being dispatched. To its credit, The Last Command has the good sense not to give Jim Bowie a black ex-slave for a companion. Wayne’s version has the servant sacrifice himself over the body of his former master, like a loyal dog. There’s no perverse ‘Anti- Civil Rights’ gesture here. Sprited performances help; almost everyone comes off well save for the rather stiff Richard Carlson. Personalities like Jim Davis and Slim Pickens contribute to the overall fun. Sterling Hayden is a gentleman all the way, with Arthur Hunnicutt a delight and J. Carroll Naish impressive as the despotic but honorable Mexican general. The two film versions are simply too close to be coincidental. Is it possible that both productions followed John Wayne’s early development plans? I wouldn’t be surprised if Wayne’s Batjac company secured technical remake rights from Herbert J. Yates, in response to what Wayne perceived as an underhanded maneuver by Republic. Even with their similarities, and near-identical action at the conclusion, both versions of the Alamo story are satisfying epics. Sometimes when I watch A Night to Remember, Roy Ward Baker’s excellent docu-drama about Titanic disaster, I mentally imagine myself replacing its sinking-ship miniatures with the awesome special effects from the Cameron Titanic, desaturating the color to B&W and cropping the widescreen format down to size. It would be almost an identical exercise to augment and replace shots of battle action in Command with the huge vistas of 1830s combat in the John Wayne version. In each case, I think the replacement shots would fall into place beautifully. The KL Studio Classics Blu-ray of The Last Command is a very good encoding of this all-but-forgotten version of the story of the Alamo. Original prints were in Republic’s TruColor, but since a standard Eastman color negative was exposed on the set, the disc’s hues look completely normal. Jack A. Marta may not have been a legendary Hollywood cameraman, but his work was always in demand at Republic. When that decades-long gig dried up, he moved on to freelance for Bert I. Gordon, TV shows like Route 66 and Batman, and even Steven Spielberg. 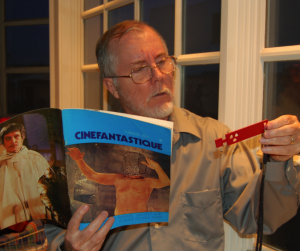 Author Frank Thompson has no difficulty laying down an excellent commentary track for The Last Command; he’s written extensively about the various film versions of the Alamo story. Thompson touches on the historical issues, noting where the screenplay follows the known facts, and comments on the film’s particulars from a refreshing perspective. Yes, Wayne’s The Alamo is frequently referenced, if only because it’s the version everybody remembers.